I kept the measurements loose here, because it's breakfast, and because each will be dictated based on appetites, pan size, and what you happen to have in your fridge. Hollandaise would be divine drizzled overtop. 1In a medium saucepan, cover the potatoes with water and bring to a boil. (Yes, leave them whole.) Cook for 20 minutes, or until just fork-tender; drain and cool under cold running water. Set aside to cool, or refrigerate for up to a couple days. 2Set a small, heavy (cast iron is ideal) skillet over medium-high heat, add a drizzle of oil and if you like, cook the salami or ham for a few minutes, until slightly crisp. Meanwhile, coarsely grate a potato or two using the coarse side of a box grater. Season with salt and pepper right on the cutting board or countertop. 4Top with cheese and either cover with a lid to help it melt, or run it under the broiler for a minute or two to melt it. Meanwhile, fry or poach a couple of eggs in another skillet - or slide the rösti out onto a plate and cook the eggs in the same pan. Repeat with the remaining potatoes. 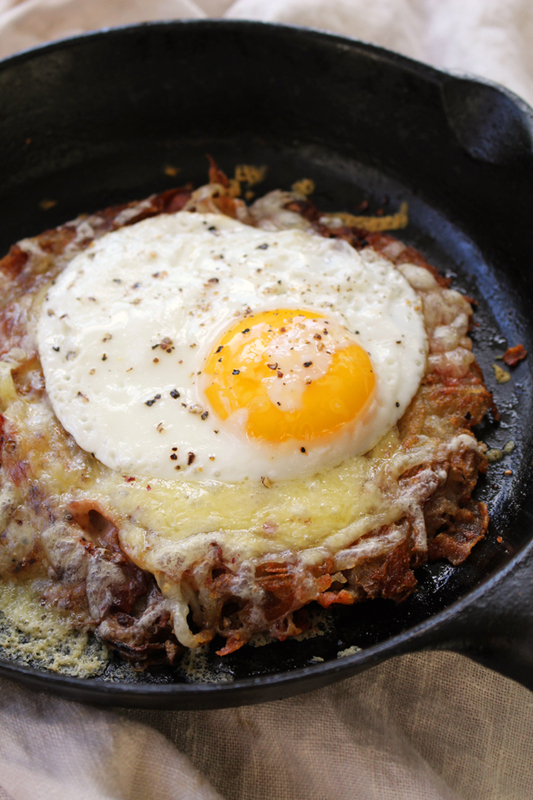 5Serve the eggs on top of the rösti.